Ice-T has already managed to turn his culinary inexperience into ad revenue. A couple weeks back, the rapper and Law & Order: SVU star revealed that he had never eaten a bagel or drank a cup of coffee in his life (despite playing a cop on TV), and Twitter freaked right out. Now, though, Ice-T has not only sampled the breakfast of champions, but he's turned the first-time experience into an advertising partnership for a dating app. Ice-T posted a video ad to Twitter the other day, which sees him trying a coffee and a bagel on behalf of dating site Coffee Meets Bagel. Unfortunately, he didn't seem to be a perfect match for coffee — taking a sip and declaring that it would be his last. "Why would you do that?" he pondered. The clip also sees him trying bagels. First up, he tries a plain bagel with cream cheese (or "an unsweetened donut," as he put it). 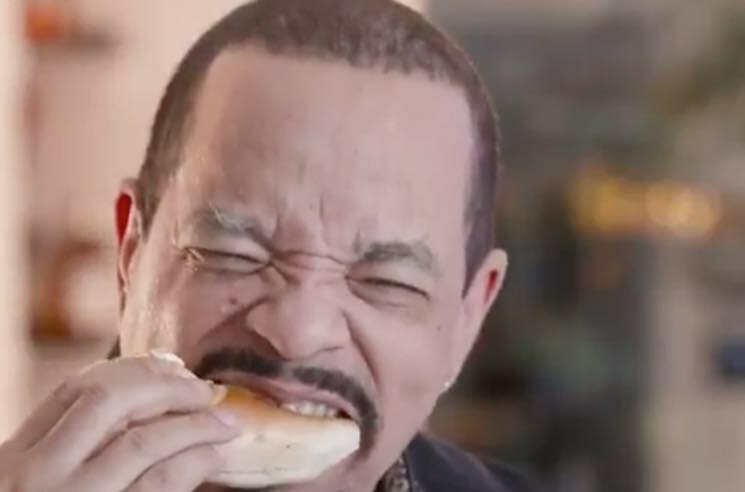 "It's not bad," Ice-T said, before observing that "it has a different consistency than a donut" and determining that after one bite, "I feel like I just ate a loaf of bread." He also tried a bagel with cream cheese and lox, but the chewiness prompted some dental fears about pulling out fillings and caps. "I just tried something new," Ice-T concluded, before suggesting that viewers do the same by looking for their next date on Coffee Meets Bagel. Sure, it's a gimmicky cash grab, but it's still good to know that the guy has finally tasted the breakfast staples. Watch the cheesy ad below.